We feel it is important for you to make smart choices when buying life insurance. We recognize you are looking to make the best decisions for you and your family - quickly and easily. Learn more about who we are as a life insurance agency and how our life insurance agents are qualified to help you. Select any of the links below to find out more about IntelliQuote Insurance Services, LLC or use your scroll bar to view the entire page. We’re online life insurance brokers who are licensed to offer life insurance services in all 50 states and the District of Columbia. We can help you find the coverage you need wherever in the US you’re based. IntelliQuote Insurance Services, LLC (IntelliQuote) is the smart choice for life insurance. As a life insurance agency and an online insurance marketplace since 1997, we make it easy for you to compare, shop, and save on life insurance costs. 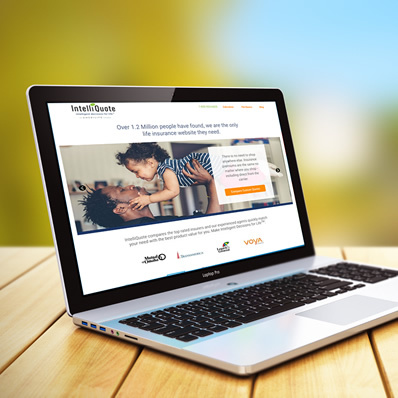 Our online quoting platform lets you compare life insurance quotes instantly. Compare between many of the top rated life insurance companies in the US. We believe in only providing quotes from the best insurers in the industry. That’s why we watch over 1,500 life insurance providers and only work with those that maintain an A.M. agency rating above A-. Our online quoting system allows you to browse through your quotes at your convenience so you can take the time to find the policy that best fits your needs. Once you have chosen your coverage option, we ask you speak with one of our licensed agents. This means that you get the convenience of shopping online and the benefit of having an expert double check your choice. Our agents will assist you on matching the insurance provider with your unique circumstances and confirming that the coverage amount requested is appropriate for your needs. This helps ensure that you get the best value for your needs. However, if you’d like help choosing a policy our qualified life insurance agents are always available to answer your questions and recommend coverage options from top carriers that meet your individual needs. Our online life insurance broker platform combined with highly trained life insurance agents offers the best of both worlds. It combines the convenience and privacy of shopping online, and telephone assistance from experienced licensed agents to help you with your unique life insurance needs. Our agents can offer guidance and advice based on your specific situation. They are here to help you make an informed decision and have you feel confident about your choice. Life insurance can help you provide financial protection for your family. There are a few types of life insurance available, with each type of policy offering a unique combination of coverage length, policy cost, and flexibility. Term life plans provide fixed term coverage at the most affordable prices. If you’d like coverage for a set period such as 10, 15, 20, or 30 years, then this type of policy offers the best value. Universal life insurance is a flexible form of whole life insurance. Policyholders are able to adjust their coverage on a year-by-year basis to ensure their plan continues to best fits their needs. If you value flexibility over budget and want a policy that last for life, consider a universal life plan. We understand that seniors have unique life insurance needs. We provide senior and final expense insurance quotes to help you cover end of life costs or leave a financial lump sum to a loved one. Since 1997, our mission has remained clear and resolute in being a premier online insurance marketplace where we offer our customers a more intelligent way to compare, shop, and save on insurance costs. We consider ourselves the best online insurance broker and are here to help you with all of your life insurance needs.